It should be noted that sales tracked by the market research group are based on individual models and colors, so a product lineup with multiple colors —like the iPod nano or iPod shuffle —can be come diluted due to the number of options. Regardless, the performance of the iPod classic among all media player sales is impressive for a product some have thought to be near discontinuation for years. NPD's retail tracking includes sales in retail stores, as well as via online outlets —including Apple's own Web store. 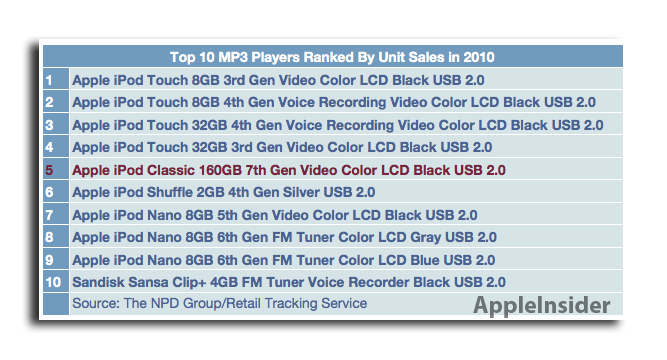 Just behind those products —and ahead of all colors of the iPod nano and iPod shuffle —was the black iPod classic. The strong performance of Apple's legacy iPod in 2010 could quiet some rumors that Apple plans to cancel the product, even as availability at some stores has dwindled.